Elijah Wood (Frodo), Ian McKellen (Gandalf), Viggo Mortensen (Aragorn), Sean Astin (Sam), Liv Tyler (Arwen), Billy Boyd (Pippin), Dominic Monaghan (Merry), Orlando Bloom (Legolas), John Rhys-Davies (Gimli), Ian Holm (Bilbo Baggins), Christopher Lee (Saruman), Cate Blanchett (Galadriel), Bernard Hill (Théoden), Brad Dourif (Gríma Wormtongue), Miranda Otto (Éowyn), David Wenham (Faramir), Martin Csokas (Celeborn), John Noble (Denethor), Andy Serkis (Gollum), Karl Urban (Eomer), Hugo Weaving (Elrond). Peter Jackson (Dirección), Jamie Selkirk (Montaje), Andrew Lesnie (Fotografía), Philippa Boyens, Peter Jackson, Frances Walsh (Guión), J.R.R. 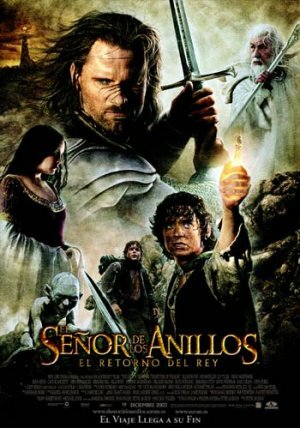 Tolkien (Guión adaptado), Howard Shore (Música), Peter Jackson, Barrie M. Osborne, Frances Walsh (Producción), Ngila Dickson, Richard Taylor (Vestuario), Dan Hennah, Philipo Ivery, Christian Rivers (Dirección Artística).